Available with DB15 or Cat5/6 computer connections. Available with or without built-in IP consoles. Available with or without an integrated LCD KVM Drawer. Drawers available with single or dual rails and US or UK keyboard. Local console connection on all models without drawers. Remote console on models with Cat5/6 computer connections. Expandable up to eight switches for 128 or 256 computer ports. IP KVM Switches provide local or remote access to multiple computers using a Java-enabled web browser. 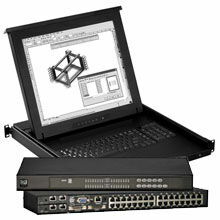 CPI offers IP KVM Switches with DB15 or Cat 5/6 computer ports. 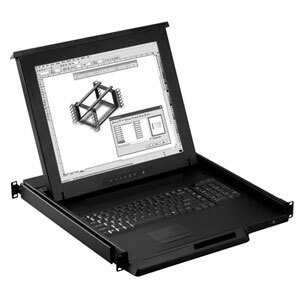 Both styles are available as a stand alone switch or with an integrated 17″ LCD KVM drawer. IP KVMs provide multiuser access to 16 or 32 computers from local console, a remote console or over the Ethernet using a Java-enabled web browser. The IP KVM Switch is an excellent solution for IT staff that require both local and remote access to equipment. Analog KVM Switches provide a simple, compact and cost-effective solution for small and medium-sized computer rooms. 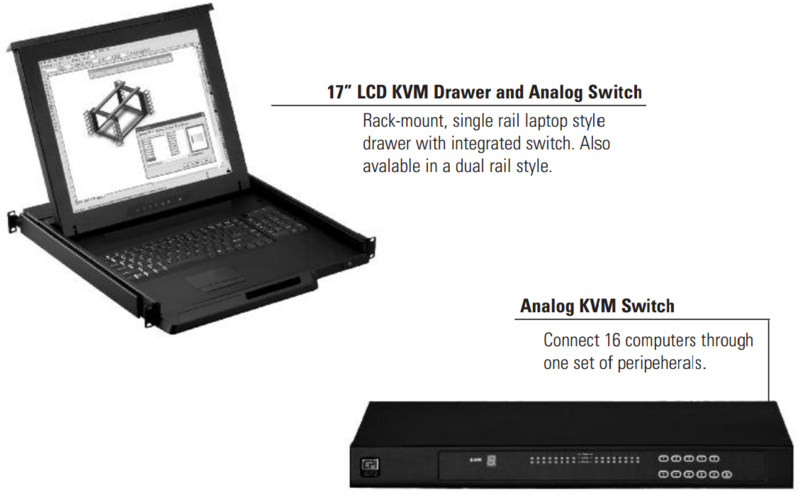 CPI offers the Analog KVM Switch with DB15 Ports to meet the needs of small to medium-sized computer rooms. It provides access to up to 16 computers through one set of peripherals. Expand by connecting up to eight switches together to access 128 computers. Rack-mount analog KVM (keyboard, video, mouse) switch. For 19”EIA cabinets, uses only 1U of rack-mount space. Connect 16 computers through one set of peripherals. Multi-platform switch, supports VGA video connection and PS/2 or USB keyboard and mouse connections. Easy switching between computers with buttons, hotkeys or on-screen display. Password protected access and eight user accounts. LEDs to indicate computer connections. Expand by connecting up to eight switches together to access 128 computers from a single set of peripherals. Also available with an integrated 17″ LCD KVM Drawer. Drawer available in single or dual rail models with US or UK keyboard layouts. CPI’s LCD Monitors include a variety of products that range from a stand alone LCD Monitor Shelf to LCD/KVM Consoles. 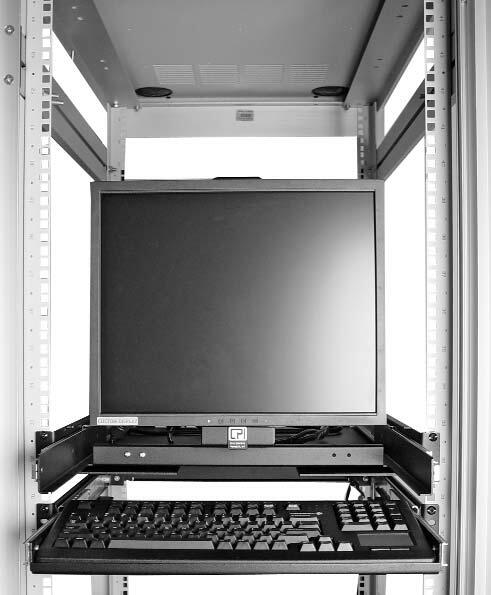 CPI’s LCD Monitors and KVM Consoles provide a single set of peripherals for convenient at-the-rack access to one or more computers. Models that do not include a KVM switch can be connected to a switch with included cable. Dual slides allow LCD display and keyboard tray to open separately. Combination rack-mount LCD panel, keyboard and touchpad drawer. Single or dual rail models; dual rail model allows the display to remain open when the keyboard tray is closed. 17” industrial TFT LCD display. US or UK keyboard layouts with integrated touchpad. Supports VGA video connection and PS/2 or USB keyboard and mouse connections. Also available with an integrated KVM Switch. CPI provides additional products to complete your installation. Full-size keyboard and touch pad provides maximum functionality with space-saving design. CPI’s LCD Monitor+Shelf and Keyboard+Tray under one part number. 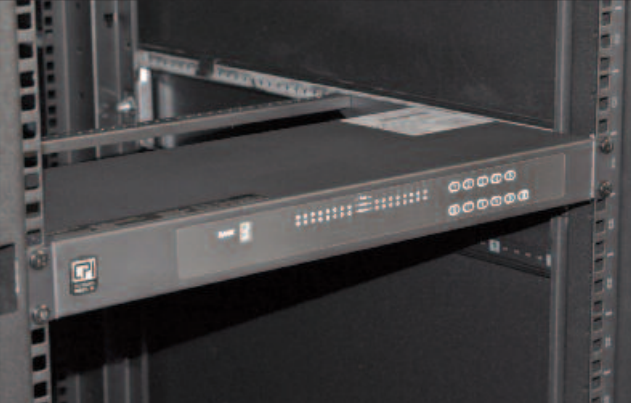 Both products together use 3U of rack-mounting space. 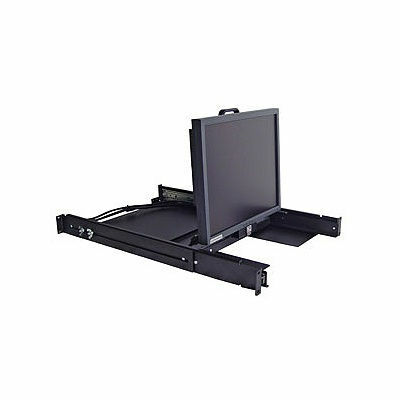 Increase usable space inside your rack with this flat-panel monitor which stores horizontally. When needed, pull out the monitor and rotate it to a position in front of your other mounted equipment.